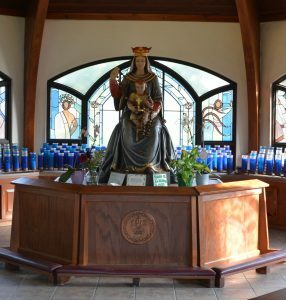 Queen of the Holy Rosary Shrine was originally the gift of an anonymous donor, who, in 1935 sent a request to the Sisters of the Incarnate Word and Blessed Sacrament, asking that a Shrine be built in honor of Mary. In 1936, Parma Heights was a rural area with few houses and even fewer businesses. Route 42 was the major north-south route connecting Cleveland, Columbus, and Cincinnati. The donor’s intention was to allow travelers a peaceful reflection place and a reminder of Mary’s love and protection for her pilgrim people. 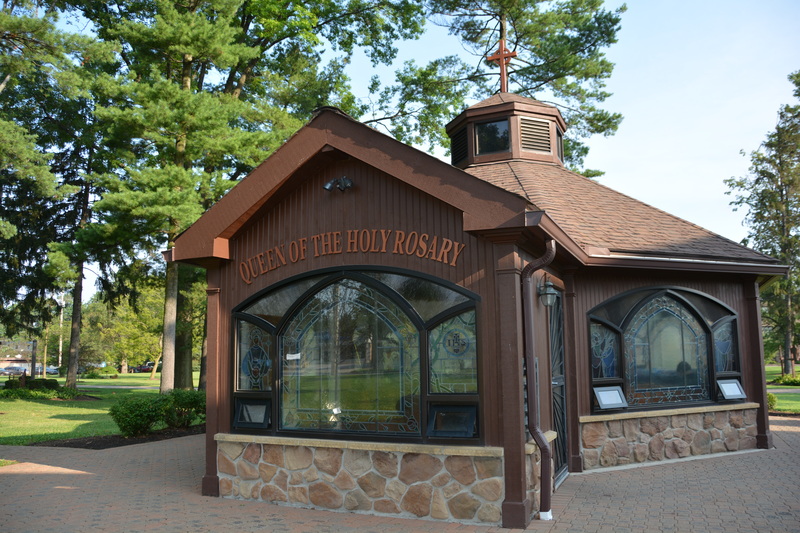 Queen of the Holy Rosary Shrine was dedicated on June 26, 1936. At that time, the Shrine consisted of a covered pavilion with a statue of Mary on a white pedestal. Around the sides of the pedestal the Joyful, Sorrowful and Glorious mysteries of the rosary were printed in clear, bold letters. In 1952 the Shrine was remodeled. Three sides were enclosed in glass blocks in order to protect the statue and votive candles from the wind and rain. At the same time, the pedestal was changed to an altar of quarried stone. The statue of Mary, holding the Christ Child on her lap, is the work of a Bavarian craftsman who worked from an original design. Working on a solid piece of wood, the artist wanted to portray an image of Mary as Queen and Mother. A large rosary extends from the hand of Mary to the hand of Christ as a reminder that the way to Christ is through Mary. Queen of the Holy Rosary Shrine was once again rebuilt and rededicated in 2000. The Shrine is slightly larger then the original, and is entirely enclosed. Stained glass windows now represent the Mysteries of the rosary and are an invitation “to look to Mary, Mother of the Incarnate Word, who teaches us to receive the grace of God with a pondering heart, and to allow the Word of God to become flesh in our very persons.” The figures in the stained glass are intentionally “faceless.” The Mysteries in the lives of Christ, the Incarnate Word, and Mary, are the Mysteries of human life, and so, we are invited to see our faces in the images in the windows. 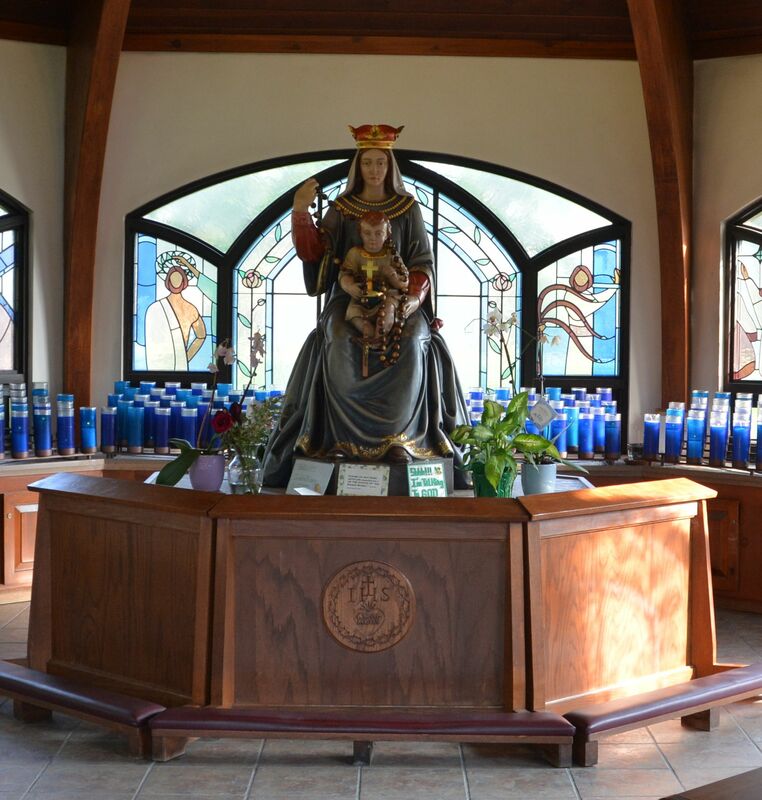 Since 1936, Queen of the Holy Rosary Shrine has become a place of prayer and peace for countless pilgrims. It is a sacred place, a visible sign that God, the Incarnate Word, dwells among us. But more importantly, it is a reminder of the visible sign we, the Body of Christ, are called to be of God who dwells within us. The shrine represents, as Scripture says, that we are “God’s temple,” the place where the presence of God is enshrined.